Amajor food manufacturer has extended its premises as demand for its confectionery has grown and extra space became a priority. Ashbury Chocolates is based in Corby, where it manufactures chocolates and toffee in a range of styles including bars, boxes, and bags, for a number of major UK and global retailers such as Gordon Ramsey. 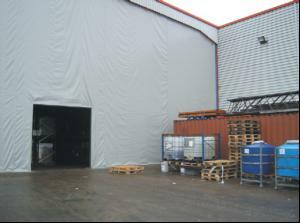 The company needed help extending its warehousing facilities quickly and without major building work due to the large amount of orders they receive. Engineers from the Stanair Industrial Door Services' Kettering depot installed the PVC wall plus an opening fitted with a roller shutter to offer quick and easy access to the warehouse facilities. This is designed to aid their accessibility and reaction time when orders are processed. Mike Etherington, the depot manager for Stanair in Kettering, planned the project from start to finish and is hoping the extension will allow Ashbury Chocolates to offer an improved and fast response to customer demands. He said: "Stanair has never done anything like this before. It was a truly unique and fascinating project to work on that I am sure it will be extremely beneficial to Ashbury Chocolates as they look to improve. "We have helped Ashbury to extend the warehousing facilities without the costs normally associated with a major extension or the waiting time for it to be completed. Our workforce has worked closely with Ashbury on this project to ensure we do the job that meets their requirements. This PVC wall is a clever way to create an extension quickly without any hassle or problems, and we are delighted to have worked with Ashbury to install it." Stanair has also completed large scale jobs for Dominos Pizza depot in Milton Keynes and many businesses in the Northants area ranging from electronic security systems, rapid action doors, window security and wall partitions. Stanair prides itself on maintaining the work that has been done and offers a 24 hour emergency service to all businesses that require maintenance assistance.